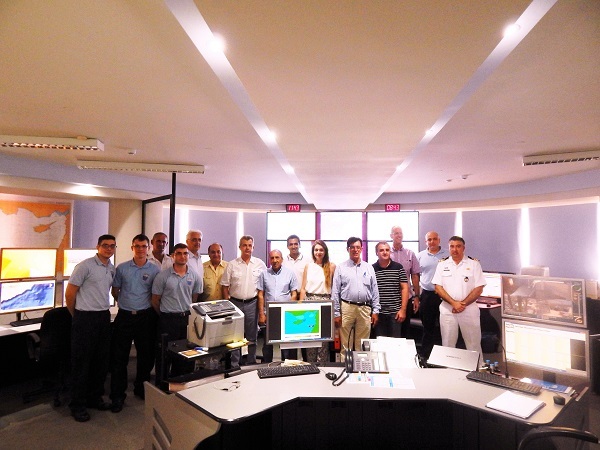 The Nautical Institute Cyprus Branch and the Cyprus Master Mariner’s Association are organized a joint field trip to the Larnaca JRCC on 14th May 2016.
has full responsibility for SAR (Search and Rescue) operations in the Republic of Cyprus Search and Rescue Region (SRR). An estimated 150,000 ships and 300,000 flights pass through this area annually. The Larnaca JRCC rescued 368 persons from the sea in 2014, and conducts on average 40 SAR operations annually. Its vision is ‘zero loss of life’. The JRCC comprises of a briefing room, a control room, few offices and a press-briefing room. Cyprus Radio is also located within the premises which monitors all distress frequencies. Not only does Cyprus Radio monitor alerts within the SRR but also receives all distress beacon signals from Cyprus flagged ships. The office is on the 11th floor giving a clear view over Larnaca port. The control centre also has strategically placed cameras (normal and thermal-imaging) along the coastline of Cyprus. The JRCC utilizes synergies with other governmental agencies. Vessel traffic, air-traffic, weather and other data are collected from agencies like the Department of Merchant Shipping and the local weather department. Water and air craft are mobilized from various governmental and private organizations. This has proved to be a cost-effective way of operating. Standard operating procedures are available for each situation and the centre is ISO 9001 and IQ Net certified. The JRCC has set itself a target of mobilizing an aircraft within 30 minutes of receiving a confirmed distress signal. Ministers and responsible authorities meet here in case of an emergency. The working areas for which the JRCC is responsible are high seas, close to shore, airport area and water dams. Cyprus is also home to one of the ground stations for the Galileo satellite navigation systems. The system carries SAR payloads that relay distress beacon signals back to Earth. The JRCC has coordinated with various navies from around the world. The last join exercise was based on a scenario of a terrorist attack on an oil platform. Overall, the JRCC operation capabilities have been tested and found to be fully reliable, sustainable and functional. What is the main means of surveillance? What is the range of the VHF? Which is the most challenging rescue operation so far? What is the range of helicopters? They can fly till the extremities of the SAR region and hover for 20 minutes. They carry extra fuel tanks to be able to achieve this range. Do you charge for the rescue missions? Who coordinates the local oil spill response? The Department of Merchant Shipping. At the end of the visit, the Chairman, Captain Graham Cowling thanked the JRCC Commander Captain Costas Fitiris for his and his team’s time in showing around the centre. He appreciated their efforts in rescuing people at sea. The field trip ended with a fish lunch at a beach taverna.